“hi , while operating a rescue boat we came across this message in a bottle . we were in the area of the river Thames in the Richmond area . 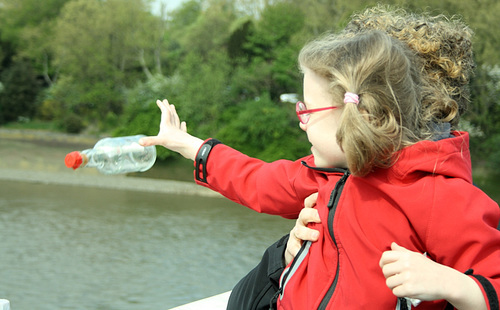 Now this image clearly identifies this as bottle number 86 which my daughter released into the river Thames in London almost exactly 17 months earlier. Uncharacteristically, it was indeed dispatched in a big bottle like this. I am delighted and a bit surprised that everything seems to be completely dry. I remember making this bottles somewhat hastily: We were going to stay in London for a couple of days, and I didn’t have (enough) bottles ready to take with me. This print, on the other hand, was already in my stash of things to maybe put into a bottle. It turned out a little too big to fit into my tiny bottles, thought, and thus I took one of the lemonade bottles that I am already stashing for when my milk bottles run out. But while writing this, and comparing images once again, I begin to think that probably, this is the original bottle after all, and the cork just looks different because the wax came off. Probably, however, it was just the finders removing it. I don’t clearly remember but it looks in the dispatch photo, like I tied down the cork and then covered it in sealing wax. That must have formed a good seal after all. In the 17 months the bottle was afloat, it didn’t come awfully far: about 15 km. But it made its way along several turns, and maybe more than once, as the river in that part is tidal. The area where it was found has several islands, too. But I don’t know whether it was found tangled in woods or other things, or freely floating in the river, or maybe washed ashore somewhere. 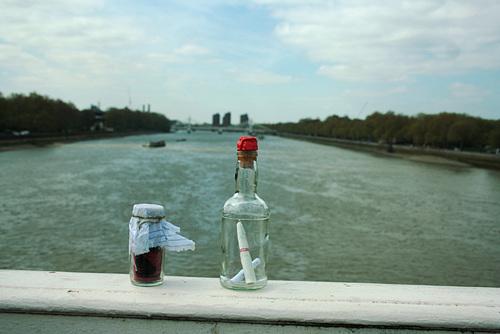 This latest found raises the percentage of bottles found in the river Thames to 100% (2 dispatched, 2 found). But the time was lacking for anything fancy, and the fact that I didn’t have any ready made was due to a general frustration because my UK-river bottles didn’t fare well to date: not a single one was found! What a lovely idea and an interesting project to do. I hope you have a great day and keep up the good art work. What joy and excitement! Barnes bridge is It is such a small message, and being really busy at the moment, it took me some time until I managed to tell you about it, but it helped to raise my spirits so much. Since then I have been making 5 more bottles, but I’ll talk about them later. 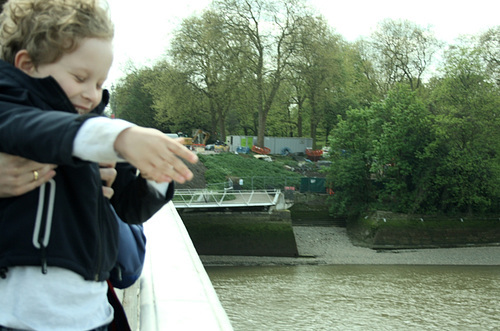 According to google maps Barnes bridge is 2 bends upstream from Chelsea bridge. But of course the tides mess with the Thames’ currents and it might have gone to and fro for a while until it was found. 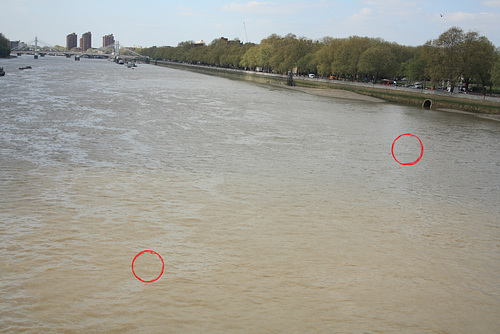 The green dot shows Chelsea Bridge (drop-off) the blue one Barney Bridge (where it was found). As I said, this was hugely motivating. Maybe I’ll just have to drop them all into the Thames? And I made 5 more since I received this notice. But I’ll show you the new bottles in a new post. I am already writing it, so it will probably come up in the next days. I hope you’ll stay tuned!